After reviewing nothing but wedge-shaped ultrabooks, the HP Folio 13 is actually a bit of a breath of fresh air. HP's design here doesn't actually deviate all that much from the rest of their notebook lineup; aesthetically it sits right between their consumer and enterprise lines (much as it's intended to), and as I mentioned before they eschewed the wedge shape and kept the build right at the 18mm cusp of Intel's ultrabook spec. 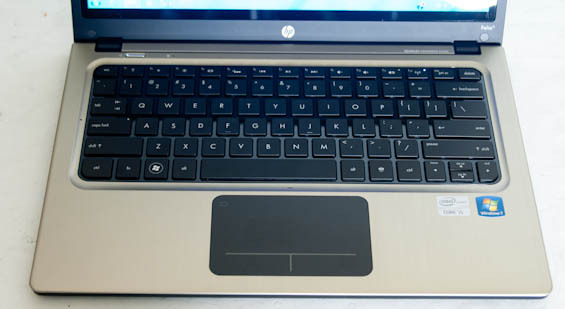 Where HP can claim a major victory with the Folio 13 is the keyboard proper. Ultrabook keyboards, by virtue of the form factor, tend to be very shallow and can be difficult to use. Since HP's engineers seem to have gone in reverse and tried to see how big they could get the Folio while keeping it thin, light, and within spec, the result is a keyboard that has much better depth and travel. It's still not perfect and feels a little on the mushy side, but compared to the others I've tested it's much more comfortable. And as a special bonus: it's backlit. Unfortunately, despite having an excellent keyboard for an ultrabook, the Folio 13's touchpad is another poorly implemented clickpad. As we've mentioned before and as Anand has even said to me personally, PC vendors still can't seem to get this part of the design down. Honestly I'm at a loss as to why they keep trying, as I have yet to use one that provides a tangible benefit over just using a traditional touchpad and pair of mouse buttons. At this point the only vendor with dedicated mouse buttons on their ultrabook is Toshiba. During testing I found the clickpad had such a hard time detecting misclicks that I was largely forced to use an external mouse. Finally, the screen on the Folio 13 is another poor-quality 768p TN panel. It's not really worth going through the full rigamarole for something that bothers all of us; suffice to say it's "competitive" with the majority of what's out there in this class, though hopefully the days of dismal notebook screens are drawing to a close as tablet screens push things forward. 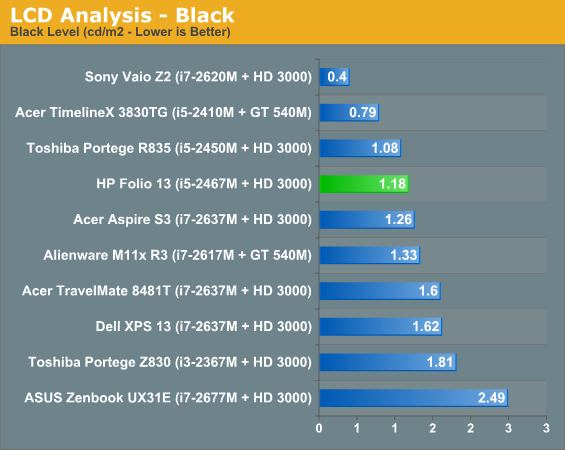 The remainder of the results are available in Bench, but you can tell the Folio 13's screen isn't very good even by ultrabook standards. 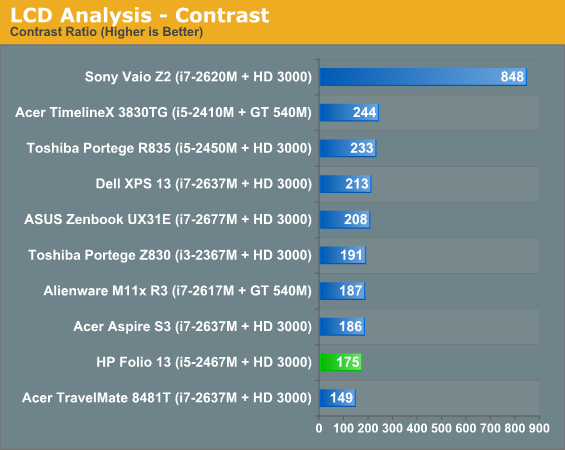 The best in an otherwise bad bunch are the ASUS Zenbook UX31E, which at least sports at 1600x900 resolution, and the vastly more expensive Sony Vaio Z2, which runs at full 1080p but costs nearly twice what some of the other ultraportables do. 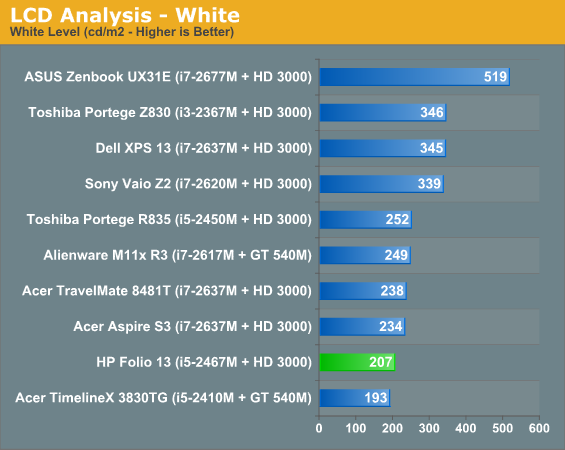 It's a shame that HP and DELL are still milking the market with these lowly 768p screens on majority of their machines. I'd let this one pass since its a 13 incher but why on earth are they still making 99% of their 15.6" laptoptops 768p is beyond me. I have to agree. My 6 year old c2d laptop has a 1280x800 screen. Why would I "upgrade" to a worse screen? The cpu is still fine for my everyday tasks and I have upgraded the 60G HD and memory that came with it. You geeks must have the vision of a hawk, 1080p on a 13" screen is 168ish DPI.